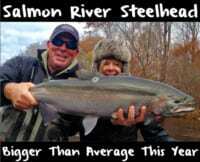 This season our steelhead fishery has been impressive in the greater Tillamook area. It’s one better runs I’ve seen in at least five years. I think this is because we have water. The last few years we’ve had drier years and they’ve been difficult to fish. However, this year every time we get a rise in water we get a fresh pod of steelhead come in. I also believe that three years ago we had a strong ocean conditions which has led to positive returns this year. I think the key thing is when those steelhead left (three years ago) they left on a good water year. They had sufficient water for them to get out into Tillamook Bay and then the ocean. And, the ocean had good upwelling for them to survive and come back. I’m expecting to see the big daddies in March. Typically, mid March and into April we see our big, native fish come in. I’m excited because we work with Oregon Division of Fish & Wildlife to collect some of these large natives and carefully transport them in a livewell with spray and oxygen. The local hatcheries pick them up, spawn them, tag them and release them. With the offspring we get big boys. We’ve caught these tagged fish in following years, which shows the program is successful. In March there’s a good egg bite in all of our coastal rivers in the greater Tillamook area. On the other hand, this year I’ve altered the way I target fish. Rather than one type of egg cure I’m now using three eggs cures depending on water conditions. When you have higher water and some color to it I like to fish an orange eggs. When the water is clear and low I like to fish a red egg. In your average water, which we call Steelhead Green, I like the pink. Take gallon Ziploc and pour a cup and a half of Natural BorX o Fire and a half of bottle of the Red Fire Brine. Seal the bag and shake it around and to help dissolve it. Then, I’ll add two skeins into the bag and put it in the fridge for two days. I’m mixing these two products because the Fire Brine serves as a color component and the BorX o Fire helps dry the eggs out and firm them up. Take gallon Ziploc and pour a cup and a half of Natural BorX o Fire and a half of bottle of the Orange Fire Brine. Seal the bag and shake it around and to help dissolve it. Then, I’ll add two skeins into the bag and put it in the fridge for two days. Just so you know, these orange eggs aren’t going to be bright orange. They are going to be more of a chartreuse/orange egg. It’s not normal, but it’s been working. We’ve been excited about the results. The pink is egg skeins in half a bottle of Pink BorX O Fire in a Ziploc bag. Basically, the norm. 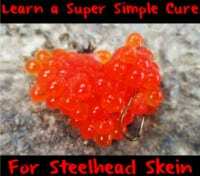 After I cure the eggs and then cut them in pieces to be fished I sprinkle Fire Power (krill powder) on the eggs. The krill is an important scent on the coast. In March, it’s no secret that all tributaries in the Tillamook area have steelhead. Every time we get a high water a bunch of fish race by us. We’ll get them in drift boats and drift fishing and plunking from the bank. However, it’s also important to have the right tackle. This means personally I’m going to be using 12-pound Maxima Treasure as a main line and 8-10 pound Maxima fluorocarbon as a leader. For bait I’ll use a No. 1 red Mustad hook. I buy 700 of them a year. Editor’s Note: Guide Pat Abel operates Pat Abel Guide Service. For more info on his guided Tillamook, Oregon, drift boat trips please visit www.patabelguideservice.com.